Pipe Coating firm adapts electrical enclosure coolers to solve host of space, heat, and operational issues. The following case study explains how natural gas pipeline powder coater EB Pipe Coating (Panama City, Fla.) used four Vortex A/C electrical enclosure coolers to solve space and configuration issues posed by conventional air conditioners on an OEM powder coating system. According to EB Pipe Coating Electrical Design & Maintenance Supervisor, Ray Hickman, the compact design of the Vortex A/C system allowed his company to create a new 48-gun powder coating system needed to efficiently apply Fusion Bond Epoxy (FBE) coating to large diameter pipes. Refrigerant-based air conditioners not only were substantially more expensive than comparable Vortex A/C units, Hickman noted, but they required high maintenance in order to withstand the heat and airborne contaminants present in the company’s facility. Not only did the six Vortex A/C units he recently installed eliminate the maintenance issues, but they also delivered much better protection of sensitive electrical components while offering a more compact and aesthetically pleasing product. Continual positive pressure protects against harsh environments. EB Pipe Coating protects large-diameter steel pipes from corrosion by applying an FBE coating to the exterior of the pipes that are used for natural gas pipelines. The process involves blasting, washing, heating, and then powder coating the pipes. The control systems require programmable logic controllers (PLCs), variable frequency drives, and other electronic devices used in various operational stages as well as the pipe transport system used to convey the large pipes through the plant. 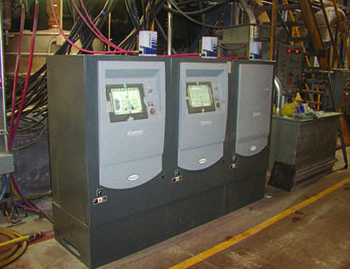 Hickman explains that not only do the PLCs create heat inside their enclosure, but hot and humid ambient temperatures—especially during Florida summers—as well as airborne contaminants from blasting and powder coating create a harsh and potentially damaging environment for the sensitive electrical equipment. The compressed-air based Vortex A/C™ solves heat and environmental issues by consistently delivering below-ambient cooling in environments up to 175°F (as opposed to a maximum ambient of 131°F for refrigerant-based air conditioners), as well as by creating a positive pressure of 1-2 psi inside the enclosure (This keeps it free of any airborne contaminants and humidity.) The Vortex A/C’s 5-micron, auto-drain compressed air filter provides additional protection by ensuring only clean, dry, refrigerated air enters the cabinet. Compact size was the deal maker. When installing a new FBE powder coating system recently, EB’s Hickman noted that the Vortex A/C’s compact size—less than one tenth the mounting footprint of a comparable air conditioner—proved to be critically important to the new system’s design and function. How the Vortex A/C works. The Vortex A/C utilizes vortex tube technology to create refrigerated air. With no moving parts, a vortex tube spins compressed air into a vortex, where hot and cold air streams are separated at rotational speeds of up to 1 million rpm. The hot air is muffled and exhausted out the back of the unit, while the cold air reaches aslow as 50°F below the compressedair inlet temperature. The cold air stream passes through an external muffler before being released into the electrical enclosure where it creates a positive pressure (1-2 psi) to keep external contaminants from entering the cabinet. As cold air loses its refrigeration to cool the electronics, it forces rising hot air out of vent openings. A highly reliable, built-in mechanical thermostat operates a valve to control airflow and cooling to maintain the cabinet within a temperature range of 80–90°F.